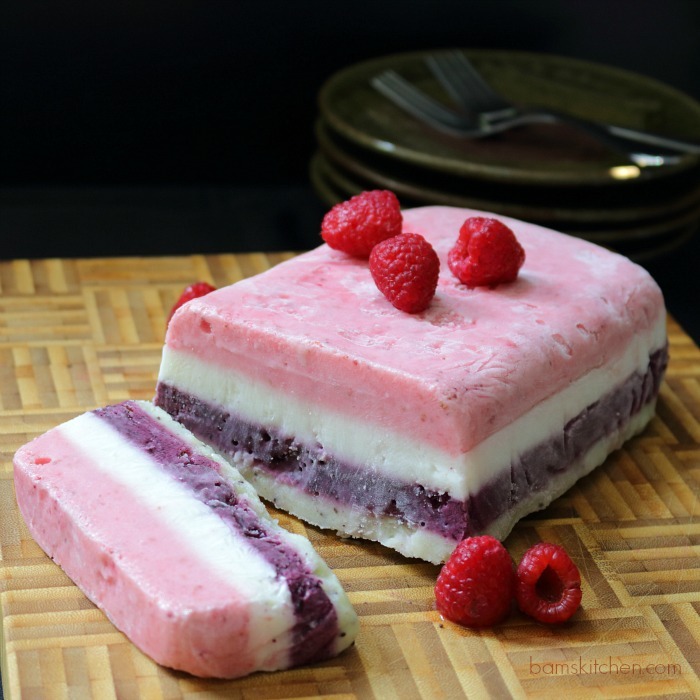 Rainbow Fruit and Yogurt Layered Ice Cream is filled with delicious sweet raspberries, blueberries, and kiwi whipped with coconut vanilla yogurt and frozen in a rainbow of PINK, white, purple and kiwi ice cream layers. 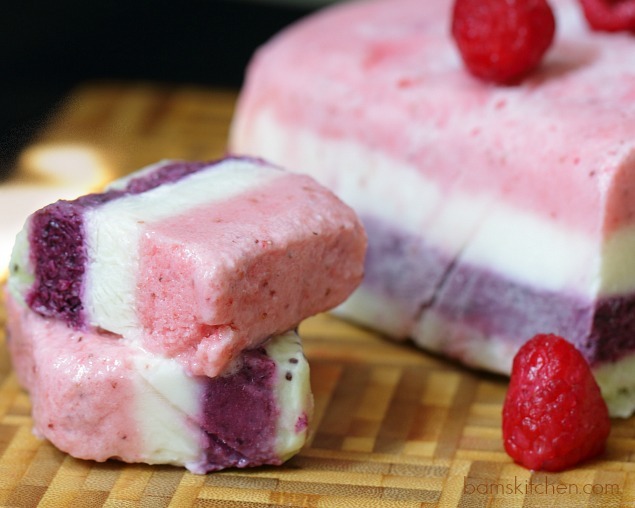 Rainbow Layered Fruit and Yogurt Ice Cream is so healthy that you could eat it for breakfast and I have on several occasions this week. It is like just eating fruit and yogurt but 100 times more fun!!! I love berries and yogurt. In addition, berries are the preferred fruit if you are trying to maintain a diabetic friendly diet. However, you can use any fruit your little heart desires. Frozen fruits are even better as they help the layers freeze faster and that is very a good thing. I used unsweetened vanilla coconut yogurt to keep it dairy free, diabetic friendly and paleo friendly but you can use any yogurt you like. However if you do not need to worry about those things, then you could just add a vanilla yogurt and all you would need to do is add the fruit. I know it looks complicated but trust me anyone can do it, it is SO easy. The hardest part is just waiting to eat it until it is frozen. Do you have a little loaf pan to make bread? If you do go find it and line it with plastic wrap both ways that is long enough to provide cover for it whilst it is in the freezer. Then, crack out your food processor, your frozen berries and your yogurt and whiz them up and put in 4 separate containers. Then you just freeze one layer at a time, let it freeze over night and then like magic you have a healthy and delicious dessert. How easy is that!?! I love those pretty PINK layers of the fruit and yogurt. 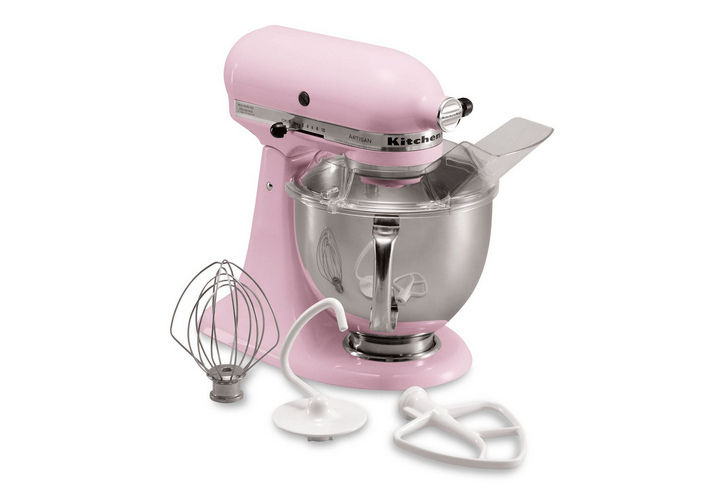 It is the time of the year that we need to be thinking about PINK. Lots of PINK ribbons. Lots of PINK food and lots of MRI's and girly checkups. October is breast awareness month. Today, this message goes out to you all of you lovely girls and women to please take care of yourself and get checked. Breast cancer is not something that happens to everyone else, it can happen to you too. This week my heart is very heavy as I have just found out that a very dear friend has just been diagnosed with breast cancer this week. However, they have caught it very early and we are very optimistic and sending loads of prayers and well wishes her way. To my dearest friend, this post is for you sending you positive thoughts and hugs from Hong Kong to you. Think PINK! Schedule your appointment girls! 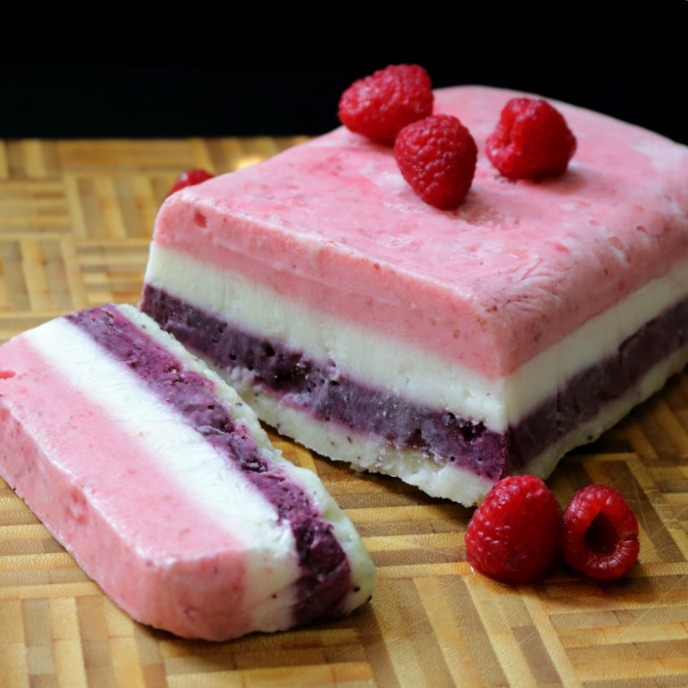 1Line loaf pan with cling wrap in both directions and make the cling wrap long enough to cover the Rainbow Fruit and Yogurt Layered Ice Cream while in the freezer. 2In a food processor add your raspberries and pulse until little icy flakes, if using frozen raspberries (if you do not have a food processor then chop raspberries finely with a knife) add 6 ounces of yogurt and either honey or sugar alternative of choice to desired level of sweetness and mix well. 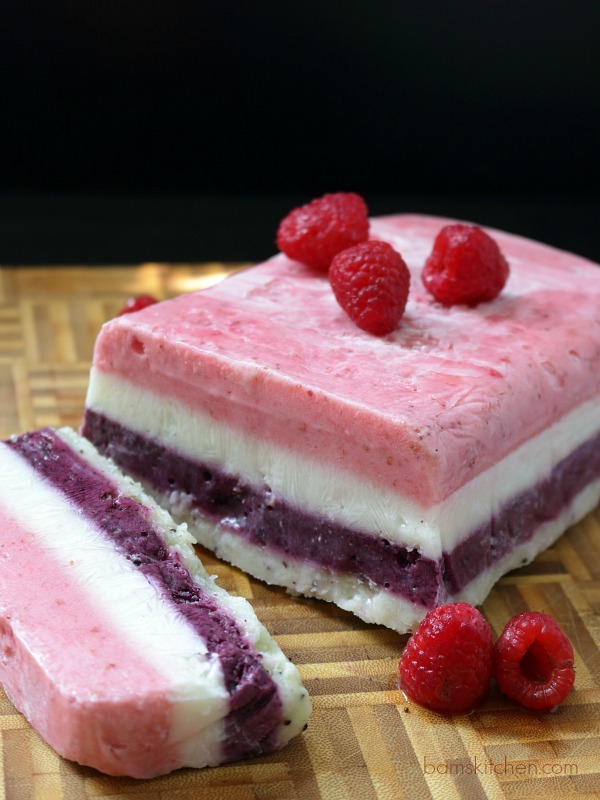 Add the raspberry and yogurt mix to the bottom of the cling wrap lined loaf pan and spread evenly. Place the pan in the freezer while you prepare the other ingredients. 3In a bowl mix 6 ounces of yogurt and sugar alternative or honey to desired sweetness. After the loaf pan with the raspberry and yogurt mixture has been in the freezer for 15 minutes, add the sweetened vanilla yogurt on top of the raspberry yogurt layer and carefully spread evenly. Return the pan to the freezer while you prepare the other 2 layers. 4Wash your food processor. Add blueberry and pulse until little ice flakes, if using frozen blueberries (if you do not have a food processor then chop blueberries finely with a knife) add 6 ounces of yogurt and either honey or sugar alternative of choice to desired level of sweetness and mix well. Place the blueberry yogurt mixture in a bowl and set in the refrigerator to keep cool. 5Step 5: Wash your food processor. Add kiwi (or any fruit of choice) and pulse (if you do not have a food processor then chop kiwi finely with a knife) add 6 ounces of yogurt and either honey or sugar alternative of choice to desired level of sweetness and mix well. Place the kiwi and yogurt mixture in a bowl and set in the refrigerator to keep cool. 6Add the blueberry and yogurt mixture to the top of the vanilla yogurt mixture and spread evenly. Place in the freezer for 15 minutes. Then add the final kiwi yogurt layer on top of the blueberry yogurt mixture and spread evenly and cover with the ends of the cling wrap and place back in the freezer for about 6 hours or up to overnight to freeze. 7When ready to enjoy the Rainbow Fruit and Yogurt Layered Ice Cream, remove from the pan using the cling wrap. Unwrap the cling wrap, invert and set on a cutting board. 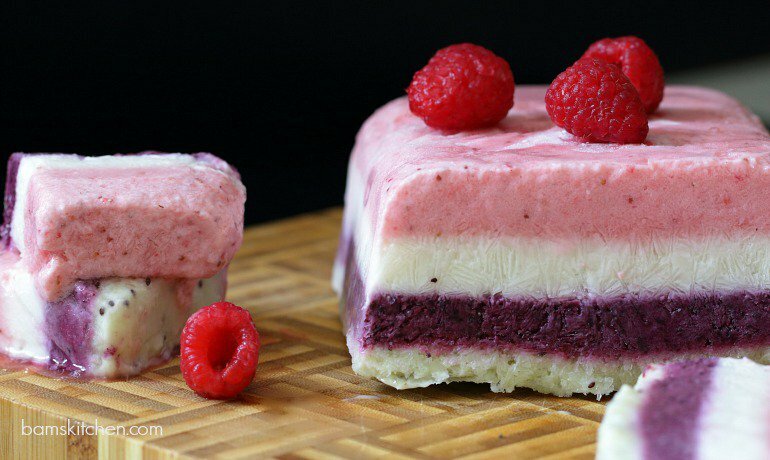 Allow the Rainbow Fruit and Yogurt Layered Ice Cream to set for about 15 minutes at room temperature, slice and enjoy with a few raspberries on top for garnish.